When you entered the hall ticket format. First you type your full name or part of the name in the name column. (Important Note: First type your name keep a single space, then you type your initial. Then the site view the list of candidates those who have the same names which you type. Then you search for your name with your father name in the list. Next you click on the enrollment number which carries above your name. 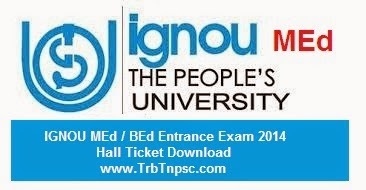 Then the IGNOU MEd Entrance Hall Ticket or IGNOU BEd Hall Ticket should be viewed. After that you can download the ignoumedhallticket or ignoubedhallticket. please check you ignouhalltickets for correct course & name. Because some name are availble in both BEd & MEd name list. After that you can download the Hall ticket copy easily and take printout. Also IGNOU publish entrance test hall tickets for some other courses in same date 7.8.2014. These are BSCN Entance Exam.